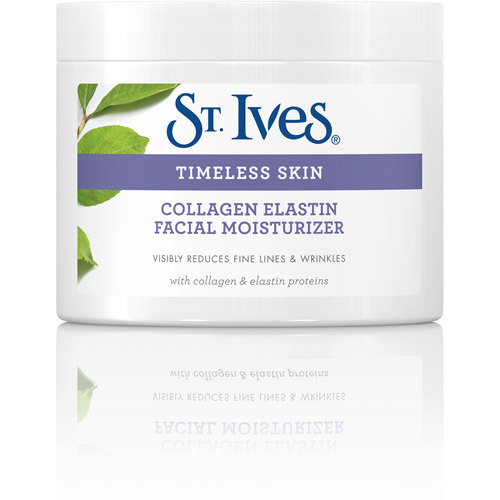 Buy ST. IVES TIMELESS SKIN COLLAGEN ELASTIN FACIAL MOISTURIZER in Malaysia. ST. IVES TIMELESS SKIN COLLAGEN ELASTIN FACIAL MOISTURIZER for sale in Malaysia. ST. IVES TIMELESS SKIN COLLAGEN ELASTIN FACIAL MOISTURIZER price in Malaysia. It makes skin restores moisture for visibly softer, smoother skin. Formulated to reduce the appearance of fine lines and maintain a youthful appearance. Made with collagen and elastin proteins. St. Ives formulas use effective, natural ingredients for fresher, younger looking skin. 100% NATURAL MOISTURIZERS, which St. Ives sources from plants, form the basis of all triglycerides that make up essential oils. Glycerin is a great example; it’s an excellent moisture-holding helper for your skin and keeps it smooth-looking. - with collagen and elastin proteins. Apply to face and neck, morning and evening. Avoid contact with eyes. In case of contact with eyes, flush thoroughly with water. Product : ST. IVES TIMELESS SKIN COLLAGEN ELASTIN FACIAL MOISTURIZER (283g / 10oz). All Items are new set, and original imported from USA.